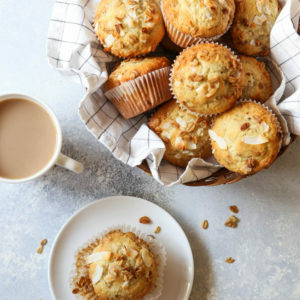 Banana bread muffins loaded up with granola, coconut, and walnuts. 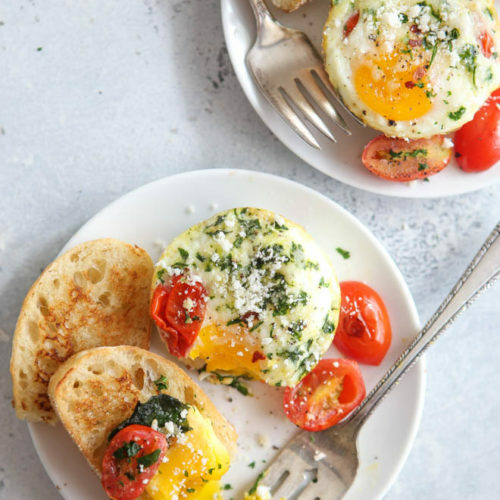 They are perfect for breakfast or a snack any time of day! It seems that we never quite eat the whole bunch of bananas we buy each week. There’s always one sad brown banana left behind in the fruit bowl. I don’t want to waste it and so I toss it into the freezer, planning to use it later. Only, I usually don’t, and I’ve built quite the collection of brown bananas in my freezer door. Last week I figured it was time to do something with them. 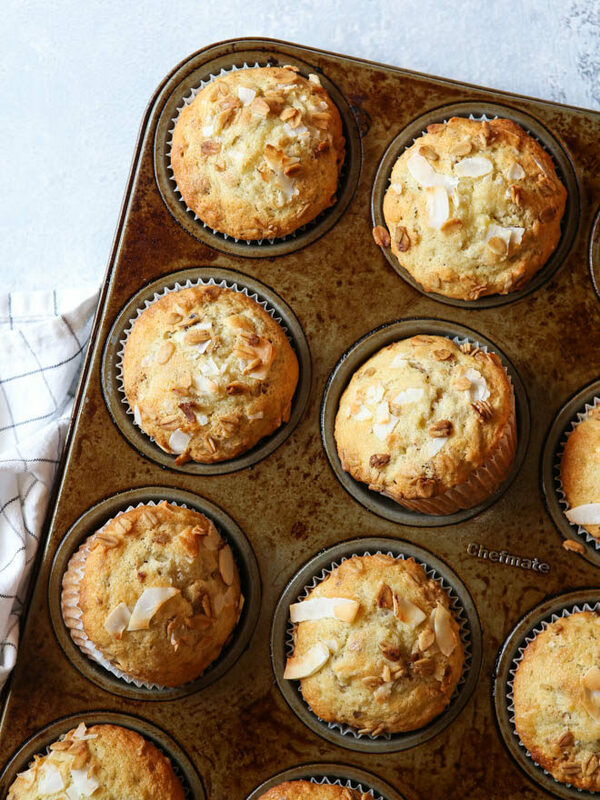 Thankfully these banana crunch muffins came my rescue! 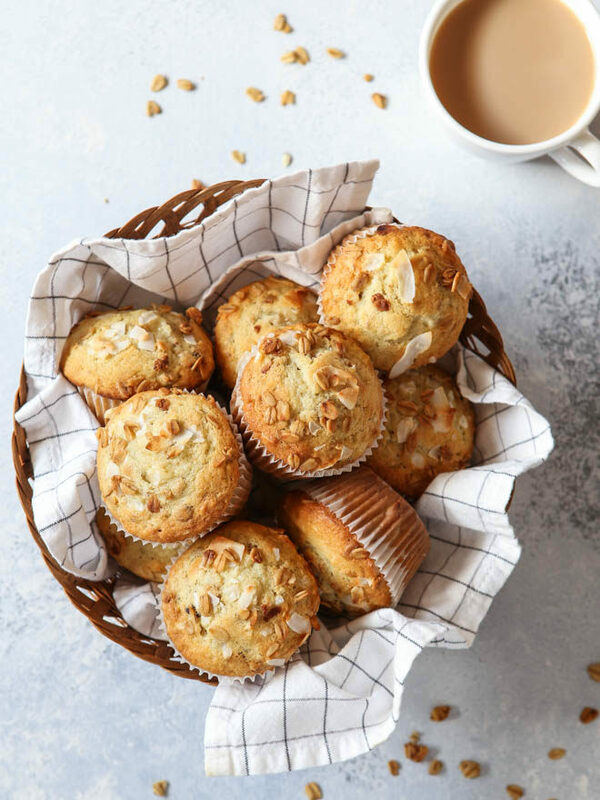 This recipe is adapted from Ina Garten, and let me tell you, that lady knows how to bake a muffin! But of course, that’s not really a surprise to anyone. I made a few changes to this recipe based on some of the reviews I read, like reducing the fat and sugar. Plus I cut the recipe in half, and ended up with one dozen perfect muffins. 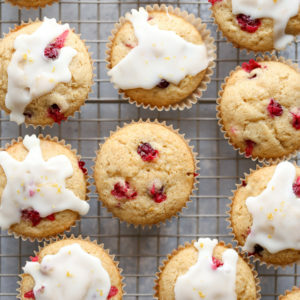 These muffins turned out great! 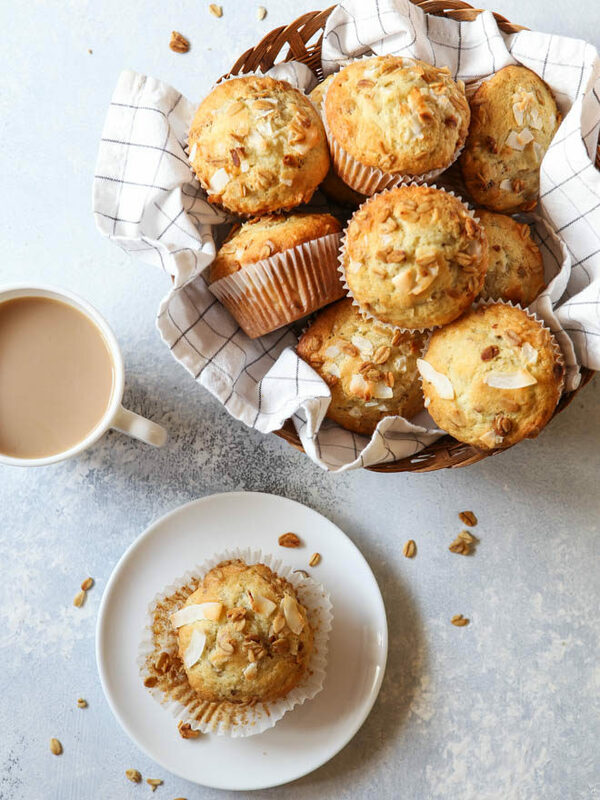 The granola, walnuts, and coconut add so much crunch, flavor, and flair to what would otherwise be ordinary banana muffins. My whole family gobbled these up; the recipe is definitely a keeper! Reduce baking powder— for each teaspoon, decrease by 1/8 to 1/4 teaspoon. Reduce sugar— for each cup, decrease by 1-2 tablespoons. Increase liquid— for each cup, add 2-4 tablespoons. Preheat oven to 350 degrees F. Line a muffin pan with cupcake liners, or grease with nonstick spray. Combine the flour, sugar, baking powder, baking soda and salt in a large bowl. In a separate bowl combine the butter, egg, milk, vanilla, and mashed bananas. Add the banana mixture to the flour mixture until just combined. Do not over mix. Fold in the walnuts, granola, and coconut. Fill prepared muffin pan to about 3/4 full with batter. Sprinkle with additional walnuts, granola, and coconut if desired. Bake for 25 minutes or until a toothpick inserted into the center comes out clean. Let cool in the pan until just cool enough to handle, then transfer to a wire rack to cool completely. Use any kind of granola you like for this recipe. Here's a recipe to make your own. 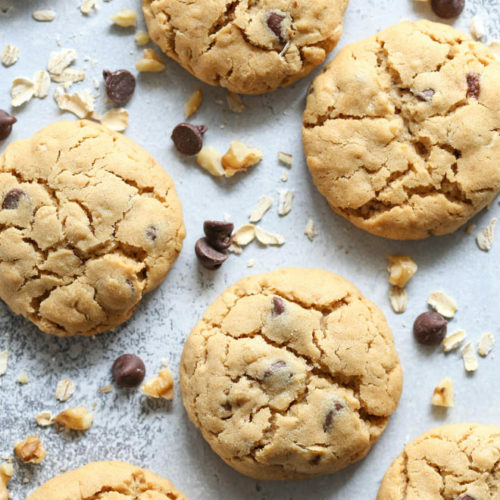 You can use sweetened or unsweetened coconut. 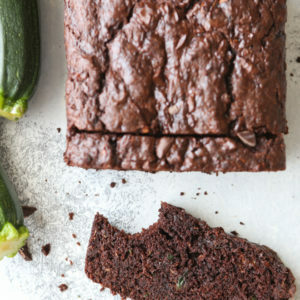 Note: Recipe originally published June 2009. Photos have been updated. Hey, I love checking out your blog – all your food looks so good! I just have to find time to try everything! 🙂 I found a website that was pretty clever that I thought you might like. You might already know it, but it looks like fun! Hi, I am Kelly, Alica's old walking buddy, and I love your blog. I want to try all your recipes. They looks so good! Those look so cute. 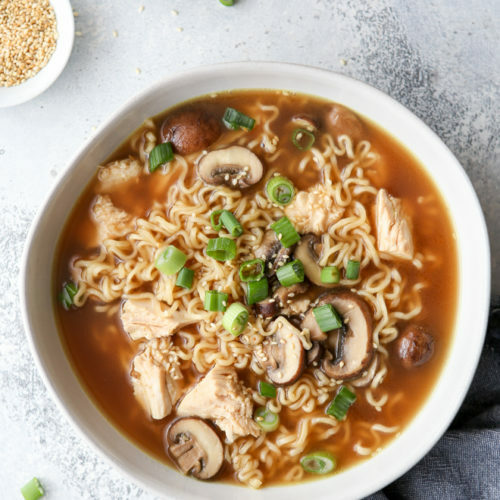 Reading this blog makes me just want to eat til I die. And nice header 🙂 LOVE that handwriting. I can't wait to move home and try out this recipe when I have a full kitchen. thanks for posting! Really??? less fat and sugar?? my goodness, this recipe calls for a full CUP of butter and 2 1/2 CUPS of sugar!!!!!! It looks like you left out where to add the butter in the directions! 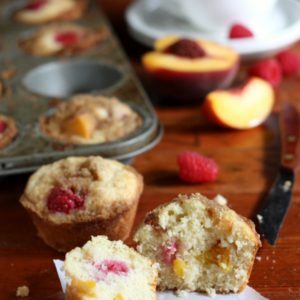 Has anyone tried these gluten free using King Arthur Flour’s GF cup for cup flour?